Lady Skywriter: Coffee in the Cockpit? It's an Institution! Lady Skywriter: Coffee in the Cockpit? It's an Institution! You knew I'd weigh in on this one. Albeit belatedly. First let me say that coffee has been consumed in cockpits since time immemorial. A reported incident of spilled coffee last week made the news only because airplane cockpits these days are very sleek and filled with chips and keyboards and computer screens instead of toggles and switches and gauges like the olden days. And we've all been indoctrinated to the hazards of having beverages anywhere near our computers. The cockpit is now off limits to cabin crews. It is an impenetrable sanctum during flight. The folks "up front" are responsible to bring their coffee with them when the enter their inner sanctum and lock the door behind them. This eliminates all sorts of threats, including witnesses to spilled coffee. A United spokesman said it was turbulence that caused the coffee spill. Personally, I'll put turbulence in a DC-4 in a thunderstorm over North Dakota up against the turbulence encountered by the Boeing B-777 in question, any day. The problem was compounded because this coffee spill caused one of the radio systems to malfunction. While trying to fix the problem, someone mistakenly punched the international distress code (7500) into the transponder instead of the no radio code (7600.) So instead of alerting air traffic controllers there was a radio problem, they alerted the world to a terrorist attack. Now there's a good example of the meaning of the word escalate. Back to cockpit coffee and the olden days, I think it must have been on a pilot checklist somewhere: call for coffee upon reaching cruising altitude. Just like clockwork, as soon as we leveled off the cockpit light would blink on (with its distinctive buzzing sound) at the stewardess console in the cabin. A word here about airplane coffee. Stainless steel containers of coffee were boarded an hour before the passengers. Who knows how long it had brewed in the flight kitchens and the food service vehicles before that. And it had anywhere from two to six hours to cook in the galley before being removed at the destination. Cruel jokes were (and still are, I imagine) made about airplane coffee. Back then, words like "sludge" and "crankcase grease" were bandied about. Without adding cream or sugar or both to the coffee, folks feared for their stomach lining. It was no easy task to keep the cockpit coffee-order straight, and when delivering, be able to sort out which styrofoam cup held what. We'd bring up the tray, distribute them and leave. I don't recall ever witnessing a spilled coffee event, although there had to have been countless "accidents." I suspect that back then there was no harm done, no interrupted flights and no keyboards to be replaced. More likely the consequences would have been limited to a few choice words and a wet pant-leg. 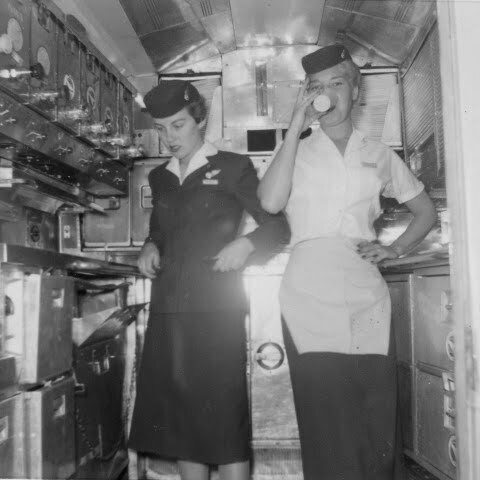 The equipment of those days would have allowed the coffee to drip harmlessly through the console to the deck. pI'm sitting at my computer in a coffee shop with a "covered" beverage (library lingo) as I read your blog. What fun! I have to say, having read of "aged" coffee, I'm really really enjoying my fresh cup.